Kalaratri Devi has a complexion that is as dark as night. Sitting atop a donkey, Her hair is let loose wildly as Her three fierce eyes permeate the space. 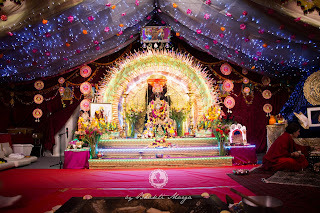 Kalaratri Devi wears a garland that beams like a bolt of lightning. Between Her four arms, two of Her hands are in the mudras that display fearlessness and the rendering of boons to all. Her other two arms hold an iron dagger, and a sickle dripping with blood. 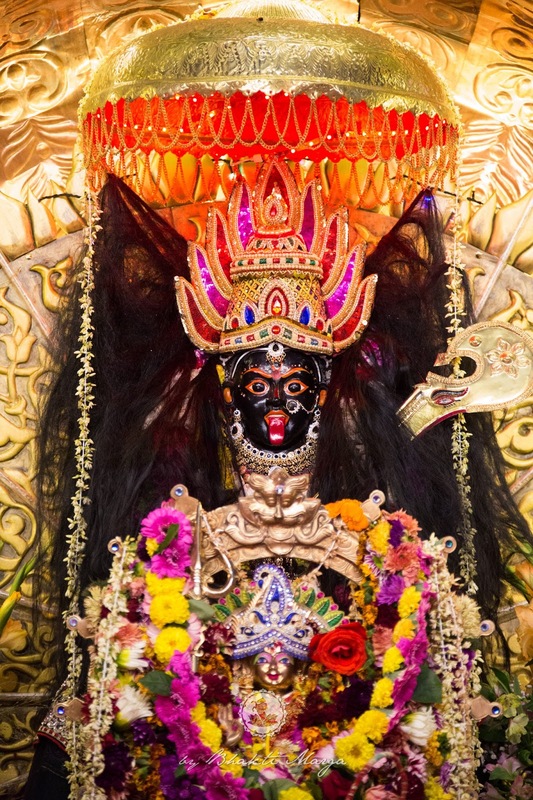 Kalaratri’s black complexion is a symbol of infinity. 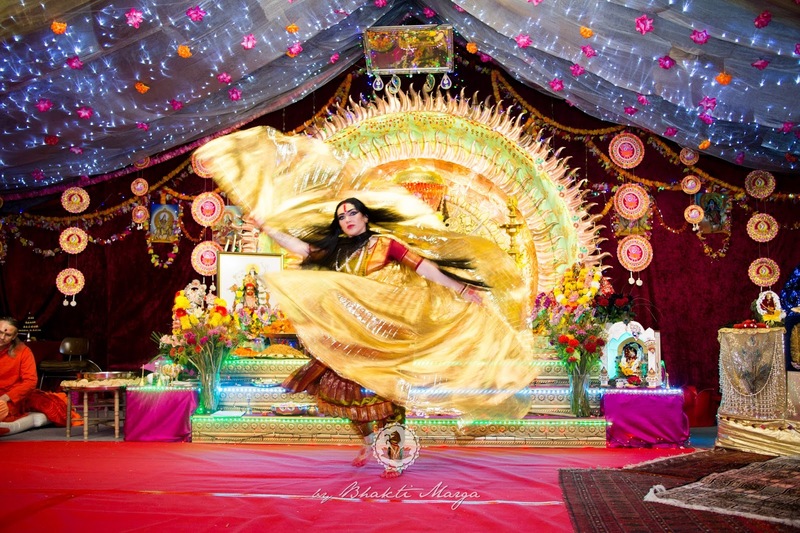 Kalaratri Devi accepts all from Her devotees, both the good qualities and the bad. She absorbs everything. Though Her form is ferocious and She can be enormously terrifying, that isn’t to say that She must be perceived this way. Kalaratri Devi is genuinely soft-hearted, and acts solely out of love for Her children. She is continuously giving, again and again, to purify Her children so that they may attain the Divine. 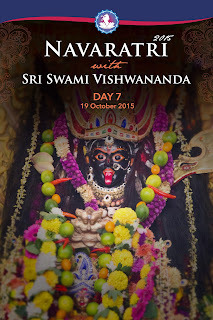 The seventh night of Navaratri venerated Kalaratri, the all-black Devi who accepts every quality we offer. 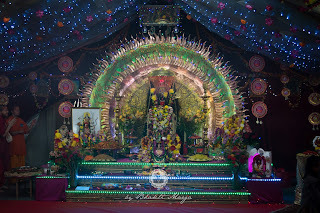 With most of the devotees dressed in black, the worship of Goddess Kalaratri was of a different essence than the previous Goddesses. Kalaratri is a very intense Devi, and so were the prayers for Her. 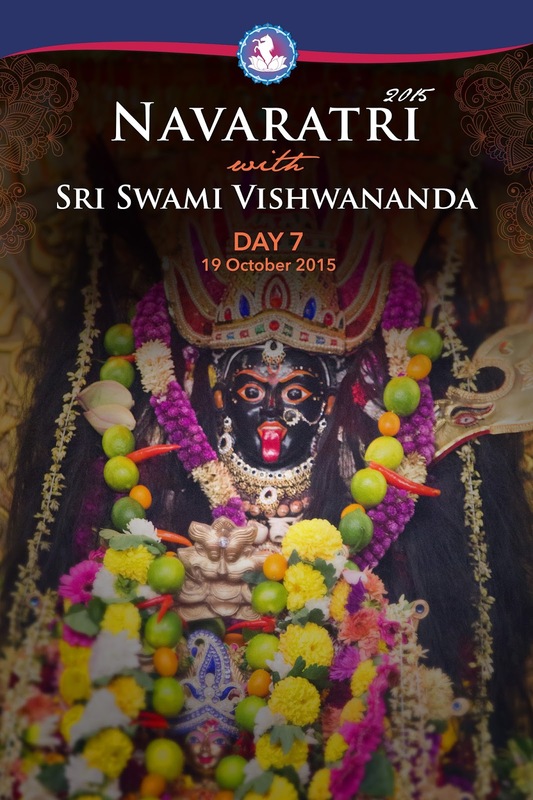 …this seventh day of Navaratri, which is Kalaratri, is literally translated as a dark night. So Maha Devi in the form of Kalaratri, in Her dark aspect, symbolises the dark aspect which is inside of each one of us. So each person inside, you are well aware of your positive side and you are well aware of your negative side. This positive and negative is part of life and it always depends on what side you hold onto. As is customary each year, everybody has the opportunity to offer rosewater and sesame seed oil to the feet of Kali (Kalaratri). Guruji began both of these offerings by first pouring rosewater over Kali’s feet. 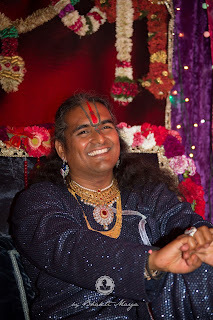 Once everybody had offered rosewater, Guruji poured sesame seed oil over Kali’s feet and began the next round of offerings. The water which you have put on Tara's Feet is to cleanse you, to purify you. This water, you can use it. Tomorrow you can take it as prasad. Use it to purify your house, to purify your place. 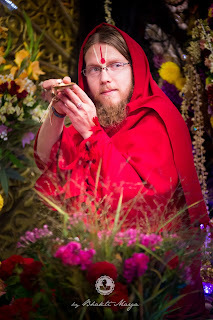 Use the water - you can drink a little bit before doing puja. You can sprinkle a little bit of this water to purify you. 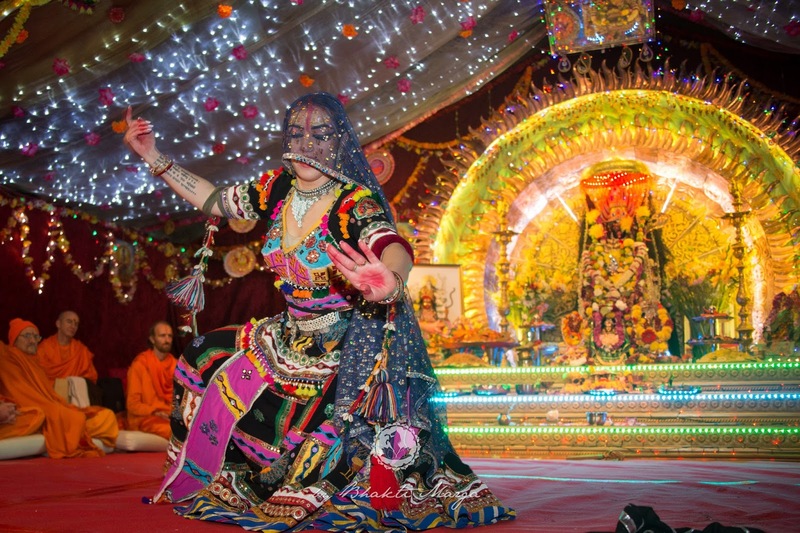 The latter half of the night included classical Indian dancing, the Devi Mahatmyam narration, and a spontaneous bhajan performance from randomly selected guests. Swamiji would throw flowers from behind the curtain, and whoever the flower would land on in the crowd, that person would sing a bhajan. 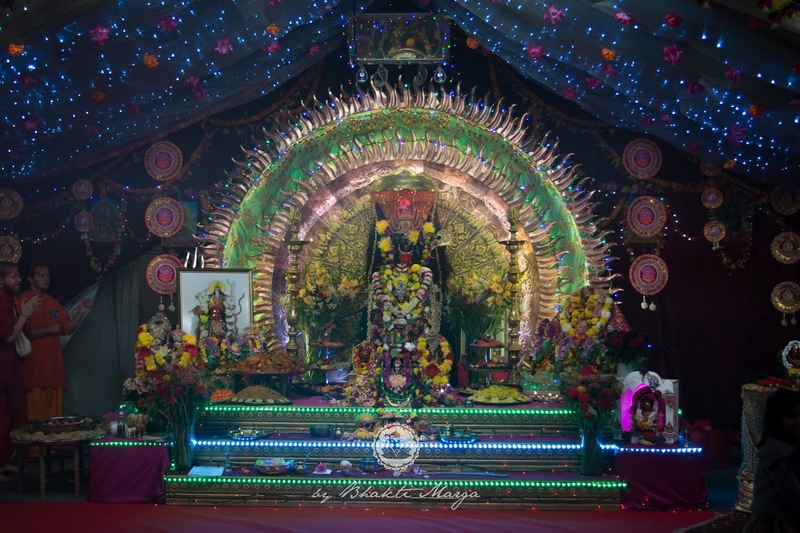 All in all, the night was rich with different forms of devotion for Maa, and since it was the night dedicated to Goddess Kalaratri, She made Herself known through the intensity of the prayers.